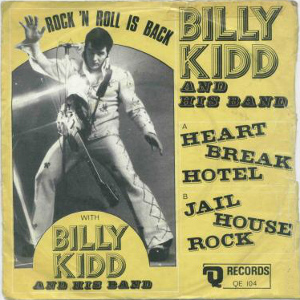 Rock & Roll singer from Galway Billy Kidd and his band toured Ireland in 1974 as a Rock 'n Roll revival act on the Rock Around The Clock tour performing songs like Sweet Little Sixteen, Hound Dog, Only The Lonely, Dream Baby, etc. Just one single was released. A forerunner of King Creole, Daddy Cool & The Lollipops, Dave Maher & The Rockets, etc. Manager Hugh Hardy made typically ludicrous, extravagant claims about the band. Recorded at Trend, prod by John Keogh.